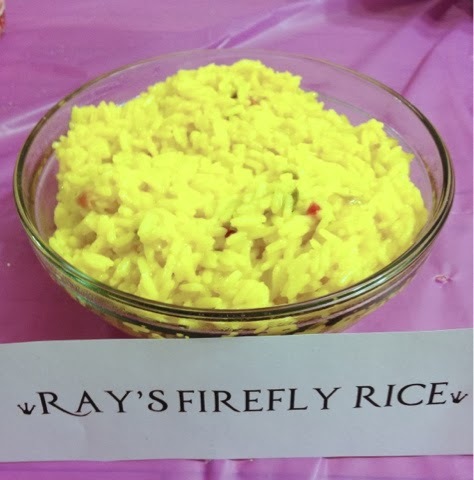 Last week, I mentioned that we do movie night every once in a while and what we eat that night depends on what movie we watched. 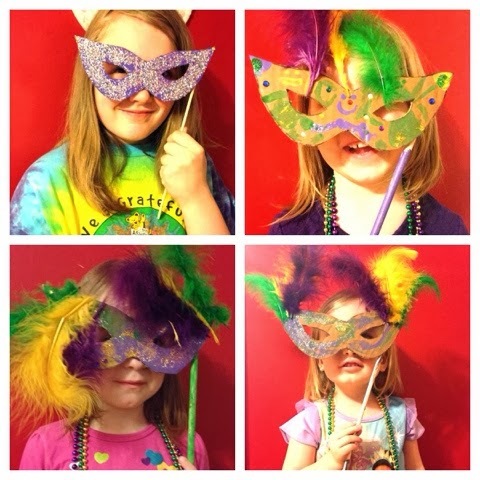 Last weekend, we watched The Priness and the Frog in celebration of Mardi Gras. I don't know why I love this movie so much, but it's one of my favorites. It was easy to find Mardi Gras decorations over the weekend. I didn't go overboard because I didn't want to spend a ton of money. We just put up some purple, yellow and green bunting, used purple table cloths, Mardi Gras themed plates and napkins. For a craft, I cut shapes out of cardboard that they painted and decorated with jewels, glitter and flowers. I glued them to a dowel when they were finished. This took them quite a while but I printed coloring pages for them to color while I cooked. 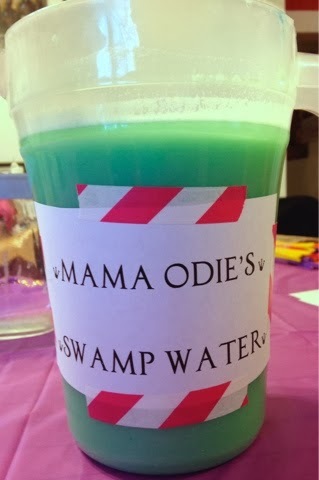 For dinner, I wanted to make a more traditional New Orlean's meal, but I have picky children. 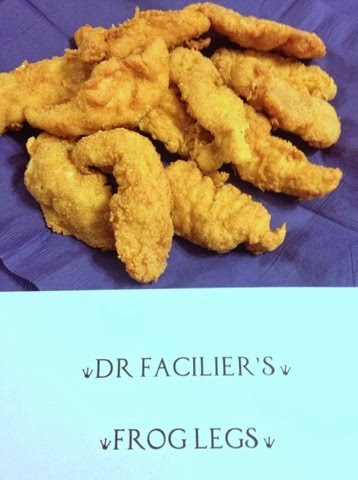 What we ended up with was Dr. Facilier's Fried Frog Legs (spicy chicken strips), Ray's Firefly Rice, Louis's Louisiana Cornbread, Tiana's "Man-Catching" Beignets and Big Daddy Le Bouf's Mardi Gras King Cake and Mama Odie's Swamp Water to drink. I really had a problem even suggesting the chicken was frog legs, but lack of time and imagination got the better of me. 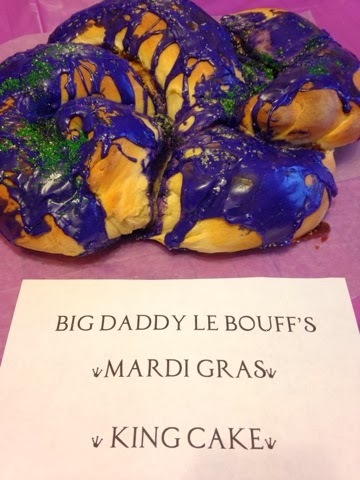 My king cake was the ugliest thing I've ever seen. It tasted great and looked good on the inside, but I don't think I rolled my pieces tight enough. To top it off (literally), I colored my glaze purple to make up for my lack of purple sugar. Not a good idea. All in all, it was a pretty good evening. Sorry for my terribly awful pictures. 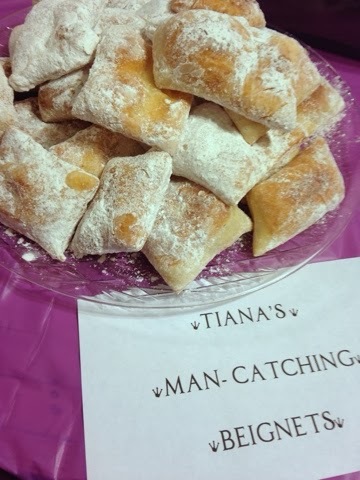 They were taken with my iPhone after I deep fried 2 of my fingers making the beignets. I promise this is something I will remedy in the future. Both the pictures and the frying of the fingers.